2017 FMS 50th Anniversary Year Celebrations. 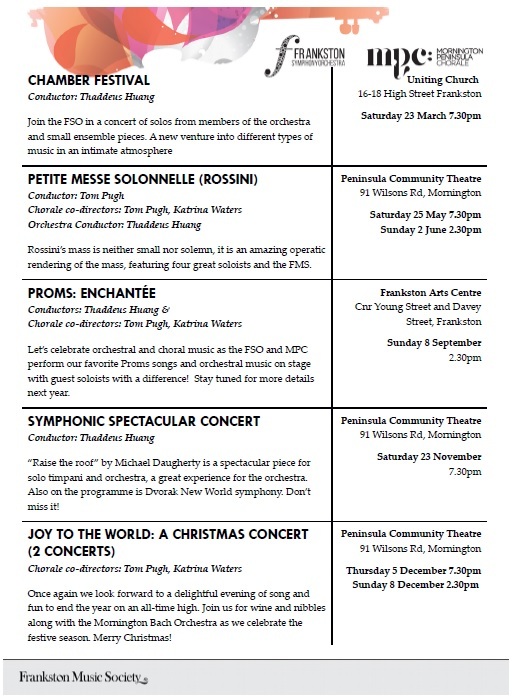 The Frankston Music Society (FMS) is home to the Frankston Symphony Orchestra and the Mornington Peninsula Chorale. We have been proudly presenting concerts in Frankston and the Mornington Peninsula for over 50 years. The Frankston Symphony Orchestra involves an enthusiastic group of musicians. We volunteer our time and experience to bring fantastic orchestral music to the audiences on the Mornington Peninsula. The Mornington Peninsula Chorale is a Soprano, Alto, Tenor and Bass community choir. We perform an Oratorio Concert as well as a Proms Concert with the FSO each year. We also celebrate Christmas with two fantastic Christmas Concerts. Join Frankston Music Society Inc.
Our Musical Society includes a full Orchestra and large Chorale that has been putting on performances in our community for more than 50 years. We welcome new inquiries from choralists and musicians interested in joining.